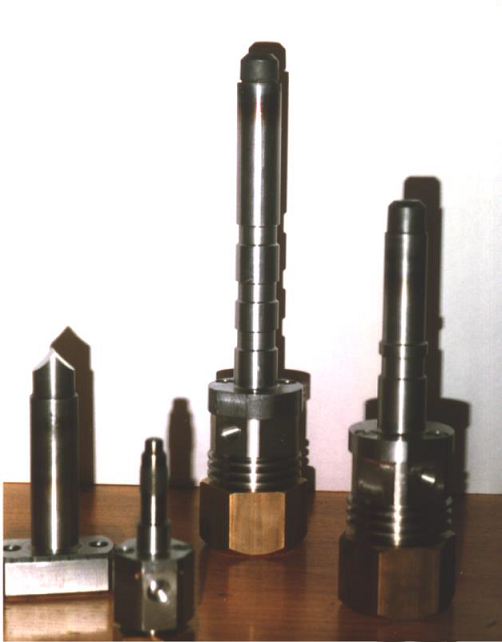 This nozzle is used for injecting liquids such as plasticisers and chemicals into extruders. The solid ECS Injection Nozzle has been tried and tested in practice, and prevents blow-back and subsequent dripping. Together with the “measuring plate”, (item 11), the injection nozzle is one of the flexible modular components manufactured by ECS, for extruders. The Nozzle is constructed with a hardened nose section (item 8) and needle (item 7), resulting in a useful life two or three times longer than normal. The opening pressure can be adjusted by turning the nut (item 1). The Injection Nozzles are inspected following production, tested and set to a specified injection pressure. The modular construction of the Injection Nozzle makes it possible to overhaul the used Injection Nozzle. ECS can call upon a well-equipped range of machines for carrying out the overhaul work. Using the Nozzle Puller, you can easily withdraw the nozzles from the measuring plate.